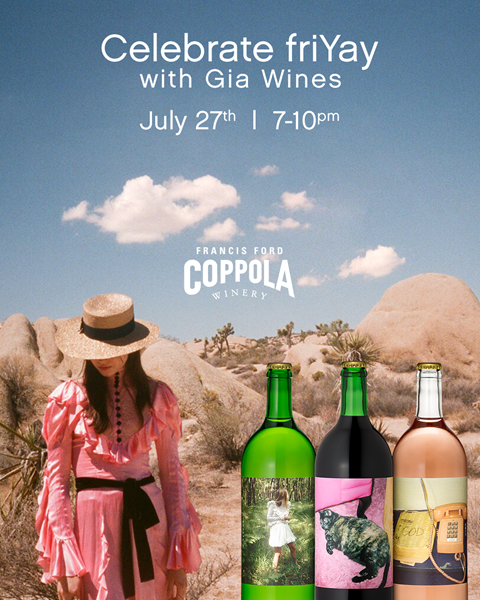 Francis Ford Coppola Winery is splashing into friYay the evening of July 27th with a pool party at Coppola Winery to celebrate the NEW wine #Collection by Gia Coppola. Shrimp rolls. Corn dogs. Nachos. Grilled corn. Arcade games. Myles Hendrik silent disco. Neon bocce ball. And the awesome wheel of deals! General Admission includes access to the pool (yes, it’s heated), a towel for the evening, four wine tickets, and an abundance of carnival style food. Seating around the pool will be on a first come, first serve basis. Want guaranteed poolside seating along with a private cabin? Check out the Premium Package. General Admission: $50 (plus tax) per person. This includes access to the pool, four wine tickets, food and activities. Premium Package: $150 (plus tax) This includes TWO tickets, private Cabin access, and two reserved poolside lounge chairs, along with four wine tickets, food and activities. Tickets are required. Guests must be 21 years of age or older.